Prynn lived with her mother and father for a time in Tuscany. She celebrated her fifth birthday at the home in Tuscany. Tenmei joined Starfleet Academy in 2369. Shortly afterwards, her mother was lost during an action against the Borg, on a Starfleet Intelligence mission commanded by her father. Tenmei knew her mother's transponder code, and she began scanning for it on every ship she served on. Tenmei's relationship with her father was taxed after the death of her mother. Vaughn distanced himself from Tenmei out of guilt, believing his young daughter justified in blaming him for depriving her of her mother. As a result, Tenmei was emotionally abandoned at a time when she most needed such support. The strain on their relationship would last for years. After graduation, she was assigned to the USS Mjolnir as a flight controller. Mjolnir Captain Kalena Hoku taught Tenmei the art of surfing, and once described Prynn as being "a bit intense." Prynn saw action during the Dominion War while assigned to the USS Sentinel under Captain Anna Maria Amalfitano, including piloting the ship behind enemy lines. Following the war, in January of 2376, she was transferred to the USS Defiant, berthed at starbase Deep Space 9. In April of 2376 Tenmei piloted the Defiant in defense of DS9 when it came under attack from a trio of Jem'Hadar fighters. Following the battle she spent time at the bedside of a Benzite friend, Monyodin, as he died from untreatable injuries sustained in the attack. She was also nominated for a Starfleet commendation for her conduct in the battle. Tenmei was reunited with her father when he became the new first officer of DS9 in April. The two maintained a strained, but professional relationship. Several months later, Prynn served as the Defiant's pilot during a three month exploratory mission in the Gamma Quadrant. This mission was commanded by her father, and as the mission went on the two began spending more time together. The reconciliation was short-lived as the Defiant soon picked up Ruriko's transponder code coming from a downed Borg vessel, where they found a still-alive and assimilated Ruriko Tenmei. After the assimilation imperative proved too strong for Ruriko to resist, Vaughn was forced to kill her to prevent her from assimilating Tenmei. Tenmei again refused to speak to Vaughn for the remainder of the Gamma mission. After the Defiant's return, Vaughn appealed to Prynn that the last thing he wanted was to be separated from her again. Tenmei accompanied Vaughn to the signing ceremony of Bajor's admission to the Federation, and promised her father that they would meet soon for dinner. In the months that followed, Tenmei canceled her dinner date with her father on three different occasions. Tenmei again refused to speak to Vaughn for the remainder of the Gamma mission. Tenmei accompanied shipmate Thirishar ch'Thane (or Shar), with whom which she was in the beginnings of a romantic relationship, to his homeworld of Andor and attended the sending, or funeral, of Shar's deceased bond-mate Shathrissia zh'Cheen. While on Andor, Tenmei took part in a rescue operation of Shar's mother Charivretha zh'Thane, Andor's representative to the Federation Council, when she was kidnapped by a radical faction. 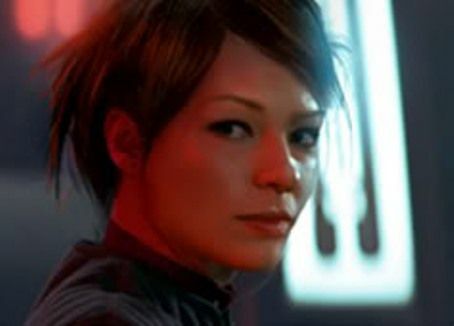 In early 2377, Tenmei was abducted by the mind-controlled Jem'Hadar observer, Taran'atar, when Taran'atar hi-jacked the runabout Euphrates and used Tenmei's services as pilot. Tenmei piloted the Euphrates toward the abandoned Cardassian prison on the world of Harkoum and was able to sabotage the ship on the border between the Bajor sector and the Almatha sector. This allowed the Klingon vessel the IKS noH'pach to detect them. Taking Tenmei with him, Taran'atar then commandeered the noH'pach, killing its crew, and used it to destroy the Euphrates. He then piloted the Klingon ship to Harkoum for his rendezvous with Intendant Kira of the mirror universe. Taran'atar left the tied-up Tenmei to the Intendent's mercenaries. When the Nalori mercenary Jaid entered the Klingon ship to claim his prize, Tenmei was able to kill him and escape confinement. After saving several of the Defiant's security officers, she found and rescued her father who was about to be killed by Taran'atar. Tenmei and Vaughn were then saved from the destruction of the prison by the mirror universe counterpart of the Cardassian Iliana Ghemor. In early 2377 Tenmei was promoted to Lieutenant junior grade.